Gerry got into the food biz at the ripe age of 7 when he started washing dishes for his family's meat market. Now he's the proprietor of his own deli right here in Erie. Food breeds kinship. From the comforts of a favorite familial dish in your youth to watching the Food Network with your roommate until 4 in the morning (guilty as charged), the topic can quickly foster an understanding between two strangers. Take Gerry Urbaniak and me, for example. I first met Gerry during my senior year at Gannon University, when a professor dictated that the class members would interview someone in a career they'd love to have in the future. Instead of staying in line with my major—a Journalism Communication student hopelessly in love with corned beef and pastrami since my father handed me my first deli sandwich when I was a young boy—I decided to follow my stomach all the way to Gerry Urbaniak's 8th Street Deli. What was supposed to be a 15-minute interview turned into a two-hour conversation on family, friends, and, most importantly, food. From family favorites growing up to our favorite style of barbecue sauce – Carolina, for the record – we discussed the joys of mastication until we were salivating. On Martin Luther King, Jr. Day, I ventured back into Gerry's Deli to meet with the man for the second time. Shortly after I arrive, Gerry walks in after making the trip from Urbaniak Bros Quality Meats. He hasn't changed much, except for the addition of an English-styled mustache, reaching an inch past both sides of his ever-present smile. For a man so gifted in the kitchen, Gerry's rather thin. Despite his hair turning snow white already, there's a youthfulness to him, that spark that comes when discussing something that you find fascinating. He beams widely as he walks up to my table, and soon we're at it like our last meeting was only a week ago. We update on anything new since our first chat. I sadly inform him about Goodman's, my favorite deli in Cleveland, closing because the owner retired. It's really the only sad moment in our 150 minutes together, as we both mourn the loss of a great eatery. You see, like me, a love of food was instilled into Gerry at a young age by his family. "[Food appreciation] is developed at a very young age," Gerry says. "You learn so much about life at the dinner table." 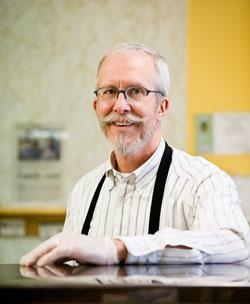 Gerry had a jump on most people when it came to food, starting at Urbaniak Bros when he was 7. The Meat Market has been in the Urbaniak family since it opened in the 1920s. Gerry started off washing dishes and cleaning equipment, but he eventually came to work with the deli meats he's known for today. After graduating from high school, Gerry left Erie for Boston College, where he studied economics. It was at the Deli Haus, a traditional Jewish Deli a stone's throw away from Fenway Park, where he encountered a new spin on the deli scene he loved so much. He loved the attention to detail owner Hymen Cohen had for every cut of meat he sold and that stuck with him. It wasn't until he moved to Los Angeles to earn his master's degree in developmental economics that he realized that not everyone appreciated their food as much as Erieites do. "It was just kind of bland," Gerry says of the Los Angeles food scene. "Everything was just the same. People there didn't know any better." During his years in Southern California, Gerry worked in the meat department at a grocery store called Albertson's. While there, he discovered that instead of diversifying their selection of foods, choices were limited. "Instead of having a variety of sausages, they just had sausage, and the locals didn't know," Gerry says, shaking his head. "[In Erie], you have all types of sausage here. You try to have just one type of sausage in Erie, people here won't have it." Gerry gives credit to the various ethnicities for how well-versed Erie locals are when it comes to what they eat. "I've always been amazed at how Erie people relate to their food," Gerry says. "In Erie and Boston, the ethnicities really appreciated their food. They were always very specific about what they would want and the area would grow from it. L.A. back then was just so homogeneous. If you were Russian, German, or Polish, you were just white." For Gerry, so much of what makes food become so good comes from different cultures. It's the recipes handed down from someone's grandparents eventually going out into the world. It's about the comfort that comes from biting into a juicy corned beef and pastrami sandwich or smelling garlic roasting in the oven. So, it's no surprise that after Gerry earned his master's degree, he came back to Erie and worked at Urbaniak Bros. He and his brother Andy expanded the business, adding new products and venturing into the poultry and cheese realms. Eventually, the two brothers opened up Andy and Gerry's 8th Street Deli in 2000, an establishment that's earned Gerry the admiration of many a carnivore. Since then, Andy has switched focus to Urbaniak Bros, but Gerry has kept the quality cuts flowing for his feasting customers. In fact, Erie isn't the only place that Gerry has made an impact on. Back at UCLA, he consulted for both the Ivory Coast and Botswana. About seven years ago, Gerry worked for the United States Agency of International Development in both Kazakhstan and Uzbekistan. While there, he helped in the process of getting meat-processing plants abandoned from by the Soviets started up again, discussing recipes and food preferences with the locals and setting up shipping routes throughout the country. Still, for a man as that's been on both coasts of America and overseas, he still loves being in northwest Pennsylvania. Throughout our meeting, regular customers stop over to say hello, a bond created by an appreciation for good food. "It's a constant challenge working in Erie," Gerry says. "You have to market the food, provide a good product, and price it appropriately. They have an expectation of having great food in Erie. It's nice to know the owner, the servers, the cooks. It's like a family thing. That's what makes this place successful." Aside from the influx of Gerry's lunchtime kinfolk, the Deli family is a little closer now. On June 4, 2011, Gerry married Dinah, his longtime girlfriend and manager at the deli, at the Erie Yacht Club, the first time the acting Commodore of the club was married at the site. Now, Dinah continues to mind the 8th Street Deli as Gerry tends to the meat market with that attention to detail that Erie is so lucky to be benefiting from. After seeing Gerry this in love with what he does, I guess I picked the right man not only for that senior year project, but also to spend my MLK day with. There's nothing quite like seeing the happiness something as comforting as good food can bring to a person. Gerry's right. Food is a family thing. So, when are you going to join the family?